Tower of Syene | Looking for that Blessed Hope! THE EGYPTIAN foreign minister brought a breath of fresh air to the decades-long Arab-Israeli conflict when he stated unequivocally on August 21 that Israel could not be considered a terrorist state. This further step toward closer relations between Egypt and Israel resonated throughout the Arab world, where accusing the Jewish state of terror against the Palestinians is a basic propaganda tenet. Sisi’s New Approach to Egypt-Israel Relations Cairo believes that relations with Israel are strategically and diplomatically beneficial, and the trend toward greater rapprochement will likely continue. But as previously mentioned, it only seems that way. We know the opposite will happen as the Bible tells us so. Ezekiel 29 outlines a prophecy against Egypt for breaking their fellowship and support of Israel and involves the Tower of Syene that resides next to the Aswan Dam. David Govrin is the 13th (rebellion) ambassador to Egypt since the signing of the peace treaty in 1979. More importantly, in a little over 2 years, we will arrive at the 40th year anniversary of the Egypt–Israel Peace Treaty that was signed 26 March 1979. Forty is a period of testing whether it be in years or days. The question is, will Egypt pass the test….not according to what the scripture says. It is also worth pointing out that God will make the land desolate for 40 years due to their betrayal; well into the Millennial Kingdom reign. No foot of man shall pass through it, nor foot of beast shall pass through it, neither shall it be inhabited forty years. And I will make the land of Egypt desolate in the midst of the countries that are desolate, and her cities among the cities that are laid waste shall be desolate forty years: and I will scatter the Egyptians among the nations, and will disperse them through the countries. Yet thus saith the Lord GOD; At the end of forty years will I gather the Egyptians from the people whither they were scattered: And I will bring again the captivity of Egypt, and will cause them to return into the land of Pathros, into the land of their habitation; and they shall be there a base kingdom. It shall be the basest of the kingdoms; neither shall it exalt itself any more above the nations: for I will diminish them, that they shall no more rule over the nations. And it shall be no more the confidence of the house of Israel, which bringeth their iniquity to remembrance, when they shall look after them: but they shall know that I am the Lord GOD. Ez 29. Is this a prophecy that will be fulfilled before the Tribulation? The Lord say’s “I will scatter the Egyptians among the nations, and will disperse them through the countries.” This speaks to a humanitarian aid effort, for whole will help them once the Tribulation has started? Should we see this prophecy unfold before March 26, 2019…the world will never recover, the Egyptians will be scattered around the world from the devastation created by the flood of the broken dam, and Israel will be in various wars until the signing of the deceptive peace treaty with the Antichrist. As always, time will tell. At the time of the post above a news article dated April of 2015 stated Egypt was preparing for war with Israel. It has now been almost a year. Here are the more recent news articles related to the prophecy. Egypt’s higher stratums view Israel as an important, powerful ally in regional struggles. Egyptian President Sisi, in an interview with the Washington Post in March 2015, said he speaks to Prime Minister Netanyahu frequently, sometimes several times a month. 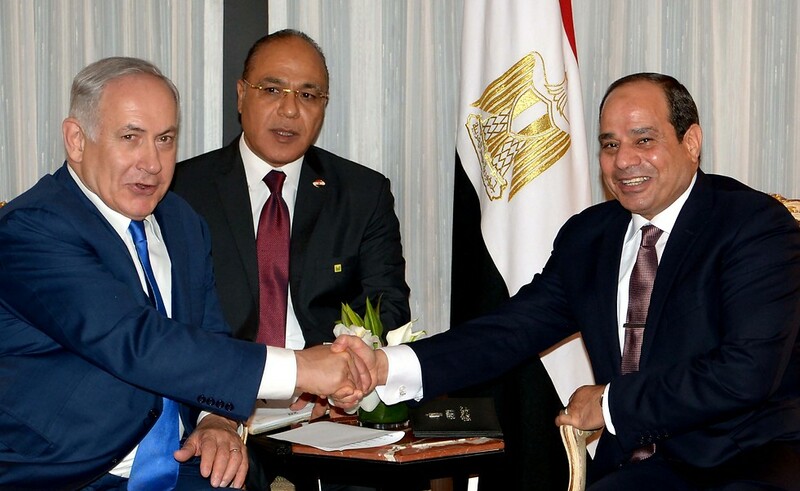 In reality, Sisi talks to Netanyahu even more than that, and not only to Netanyahu. On the list of Egypt’s close allies, Israel is a front-runner. Many of the interests of the two countries have converged and complement one another. Even the list of enemies held by Israel and Egypt includes the same names, more or less. Sisi is also well-acquainted with Israeli Chief of Staff Lt. Gen. Gadi Eizenkot. They once served in parallel positions in the Israel Defense Forces and the Egyptian army and their cooperation extends over many years. Intelligence information is almost totally shared between the sides with regard to the struggle against the Islamic State (IS) branch in the Sinai Peninsula. Israel and Egypt also rely on one another in their joint struggle against Hamas. Israel is actually a close friend, maintaining an intimate, and sometimes very intimate, relationship with Egypt. At least that’s how Jerusalem sees it. As far as the Egyptians are concerned, Israel has the same status as a mistress. It is only behind closed doors, in the innermost sanctum of the bedroom, that the lover opens up to her, pours out his heart and sometimes even puts his life in her hands. There is nothing to prevent Egypt from exchanging intelligence with Israel or cooperating with it in the fight against Hamas in the Gaza Strip, Iran’s influence in the region or Sunni radicals in the Sinai Peninsula. The two countries might even work together to steal a horse or two from Palestinian President Mahmoud Abbas. But all that happens under the cover of night. God forbid that news of it gets out, because if it did, the man would be branded with an indelible mark of shame. March of 2019 will mark the 40th year anniversary of the historic US-sponsored peace treaty between Israel and Egypt. Back in the summer of 2014 during the Israeli/Hamas conflict, Egypt’s head of government Al-Sisi, publicly announced a role in “protecting” Israel’s southern border. Egypt had offered to help Israel by closing off the Rafah Border Crossing to the Egyptian Sinai Peninsula in order to keep military arms and supplies away from Hamas. But now, an article released April 6th from Arutz Sheva says ‘Egypt is Preparing for War with Israel’. The information comes from Noha Hashad, an Egyptian pro-Israeli nuclear scientist who escaped Egypt after years of torture. She claims the Egyptian military buildup in the Sinai Peninsula to fight “terrorist” that reside there is really just a front to cover up a plan to attack Israel. Speaking to Israel Hayom‘s Emily Amrousi from her new home in Haifa, Hashad was asked to give her take about Egypt’s actions in Sinai, where the Egyptian army has been fighting radical groups such as Ansar Bayt al-Maqdis, a group that recently swore allegiance to Islamic State (ISIS). Egypt has been imposing a massive buffer zone inside Gaza on the southern border with the Sinai, evicting thousands of locals and creating a presence within the Hamas stronghold. Last February the Nile state sealed a $2 billion arms deal with Russia, and just last Tuesday US President Barack Obama unfroze American military aid that had been suspended in the violent coup that put al-Sisi in power in July, 2013. What does the Bible have to say about this? There is a prophecy in Ezekiel that mentions Egypt’s betrayal against Israel. Part of this prophecy beginning in verse one was filled during the Babylonian captivity, but when this prophecy was written, the Tower of Syene did not exist, that is until now. The rest of the fulfillment will happen in the last days. 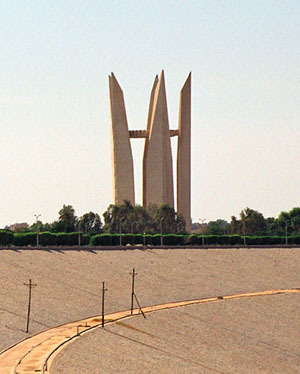 The tower was built around 1967 and resides next to Egypt’s Aswan Dam and can be seen highlighted in yellow below. What could cause the damage foretold in Ezekiel and why are the Egyptians scattered among the nations as verse 12 says? If Israel is threatened by Egypt, all it would take is a Israeli nuclear air strike against the dam. The Aswan Dam holds back the enormous Lake Nasser, 340 miles long and 22 miles wide at its widest point. The 40 years of Egypt’s desolation prophesied will continue into the millennium.